I have downloaded Sentinel 2 imagery of Antarctica and imported it into a QGIS project that also contains older Landsat imagery, line vectors, and a basic basemap. The Sentinel 2 imagery was automatically downloaded in EPSG:3857 but the other layers are all in EPSG:3031. Regardless, the Sentinel 2 imagery appears in the correct location on the basemap. 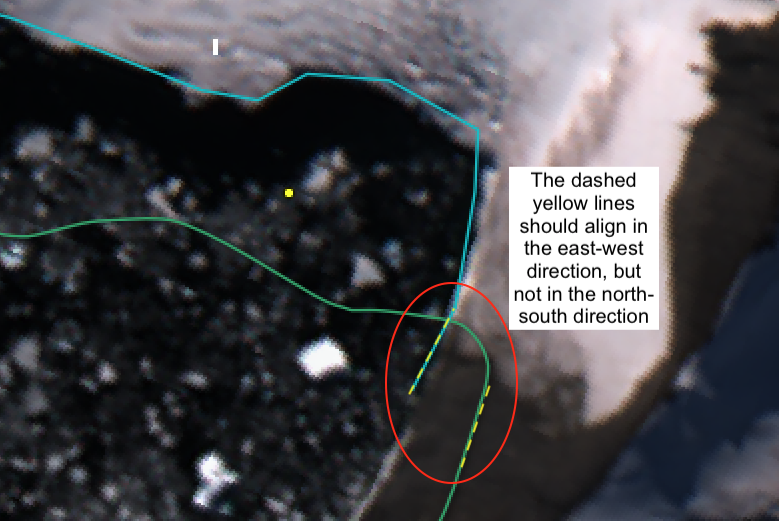 But in comparison to the Landsat imagery, the Sentinel imagery appears misaligned by roughly 120m. When the projection of the Sentinel data is changed to EPSG:3031 the imagery moves north to roughly the middle of the Pacific Ocean instead of becoming perfectly aligned with the Landsat imagery. Does anyone know why these two different sets of imagery in different coordinate systems are very closely, but not perfectly, aligned, and when put in the same coordinate system become very misaligned? If so, how do I fix this so both sets of data become aligned? Browse other questions tagged qgis coordinate-system sentinel-2 or ask your own question. Rasterization of point vector in QGis: how to align the resulting raster to an existing one? Removing cloud from Sentinel 2A imagery?